With the Destiny 2 Year 2 Reveal event taking place tomorrow, I wanted to publish an idea I had kicking around in my head for a while and had shared with some close friends for their input. I usually don’t create “concepts” for things that I don’t personally have a hand in–some part of me finds it so incredibly arrogant to say, “Well, this is what I would have done.” After some thought, however, what is an opinion or a suggestion or a solution if not that very phrase in varying degrees of action? In that spirit, I’ll be posting some ideas I’ve had (and some collaborative ideas, as well) to help keep some of the excitement and dread at bay for this reveal event. Please enjoy this Destiny 2 concept and let me know what you think. Clan Armor is a full set of gear obtained through various clan-based activities. 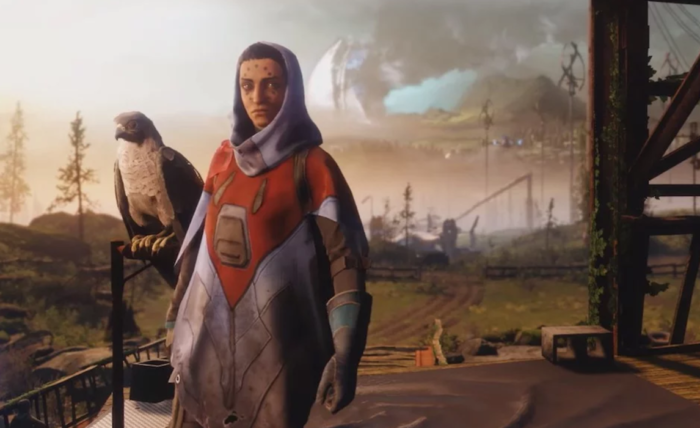 Over the course of a season, players can work together by way of leveling up their clan to unlock seasonal ornaments and mods. Clan Armor focuses on the team aspects of Destiny 2 in both its procurement and its effects. The armor will be powerful. That’s okay. The armor will have some restrictions to its use and requirements for gathering the pieces. Maybe armor in the future of Destiny 2 will provide some level of competition for this armor. For now, though, it is important to not compare this armor directly to current legendary non-Raid armor. Clan Armor can be obtained in a few ways once the clan has reached Level 1 for the season. Clan Armor will always drop a random piece from Hawthorne’s weekly Clan XP engram. Also, each weekly Clan activity engram (Crucible, Trials, Raid, Nightfall) has a high chance to drop a random gear piece. Finally, whenever an activity is completed where all of the fireteam members are also clan members, a gear piece has a chance to drop. Patrols, Lost Sectors, Public Events, Adventures, Meditations, Strikes, Raids, Crucible matches and Trials matches all have varying chances to drop gear. In order for the fireteam to be eligible, the fireteam must be larger than 1 player, but does not have to reach the maximum for that activity. A Patrol completed with a fireteam of 2 players who belong to the same Clan is eligible for a Clan Armor drop to be included in their Patrol reward. Clan Armor mods are based on contributing a particular skill to your current Clan fireteam and having the fireteam gain some kind of gameplay-based reward. In turn, provided that your fireteam is also sporting some or all of the Clan Armor and its mods, those rewards expressed in their gameplay will trigger a bonus for you, the player. This spirit of active contribution to the group is key to the theme behind Clan Armor mods. Clan Armor mod effects will only become active if all current fireteam members belong to the same Clan. The fireteam does not have to be at the current activity’s maximum capacity, however. A Patrol being undertaken by a fireteam of 2 players who belong to the same Clan will allow mod effects to activate during the activity. “…to/for all allies.”: This refers to all fireteam members, excluding the player. “…to/for the whole fireteam.”: This refers to all fireteam members, including the player. Personal stack: This is a stacking buff which is tied to your Guardian. Fireteam stack: This is a stack shared by the fireteam. Your Guardian can only contribute one stack’s value at a time to the fireteam stack. Once an effect’s maximum stack is reached, that effect cannot be activated again until the current effect has expired. Stacking an effect will reset the effect’s timer unless stated otherwise. Does not refresh: Attempting to activate the associated effect while a previous activation of said effect has already occurred and said effect is presently active will not reset the effect’s timer. Final stack does not refresh: While stacking an effect will reset its timer, reaching the maximum stacks for an effect will prevent that effect’s timer from being reset by any further attempted activations of said effect. Multikills: 2 kills within a 5 second period. Rapid kills: 3 kills within a 5 second period. Killing an enemy combatant enhanced radar to all allies in an 8m radius. Lasts 10 seconds. Does not stack. Does not refresh. Killing an enemy combatant will grant Heated Arm to all allies in an 8m radius. Heated Arm: Increases grenade throw distance by 10%. Does not stack. Does not refresh. Lasts until consumed. Killing an enemy combatant will reload the equipped weapons for all allies in an 8m radius. Killing an enemy combatant will grant +3 Recovery to all allies in an 8m radius. Completing a Crucible match grants the fireteam an increased chance to receive Masterwork loot. Activating your super generates an orb of Light for all allies. Picking up an orb of Light triggers immediate health regeneration and grants a little health to all allies. While your super is active, you grant 10% weapon damage to all allies in an 8m radius. Killing a powerful enemy with your super generates an additional orb of Light for all allies. Picking up an orb of Light while your super is charged grants you the Conduit of Light aura. Conduit of Light: When an ally activates their super, they gain 10% super damage for 1 second. Lasts 10 seconds. Personal stack. Max 5 stacks (+50% damage, 1 second). Aura radius of 8m. Final stack does not refresh. Activating your Super removes the aura. While your super is active, all other active supers gain 15% super damage. Fireteam stack. Max 6 stacks (+90% super damage). Melee kills increase grenade damage by 10% for all allies. Lasts 5 seconds. Personal stack. Max 10 stacks (+100% grenade damage). Final stack does not refresh. Grenade kills reduce melee ability cooldowns for all allies. Instant. Does not stack. Does not refresh. Activating your class ability increases grenade and melee ability damage by 15% for all allies. Lasts 5 seconds. Fireteam stack. Max 6 stacks (+90% grenade/melee damage). Final stack does not refresh. Striking an ally while your melee ability is charged will consume the charge and grant that ally an overshield. Lasts 15 seconds. +100HP. Does not stack. Can refresh. Activating your class ability grants Valedictorian to all allies. Warlock: Rifts last longer and gradually reduce ability cooldowns. Titan: Barricades last longer and can sustain more damage. Hunter: Dodging causes the next shot from your kinetic weapon to do 3x damage. Lasts 15 seconds. Does not stack. Does not refresh. Killing a powerful enemy with a power weapon drops power ammo for all allies. Rapid Kinetic weapon kills grant Shieldwrecker to all allies. Shieldwrecker: Increases all damage done to energy shields by 15%. Lasts 5 seconds. Fireteam stack. Max 6 stacks (+90% energy shield damage). Final stack does not refresh. Rapid Energy weapon kills grant Energy Specialist to all allies. Energy Specialist: Increases all damage done to powerful enemies by 15%. Lasts 5 seconds. Fireteam stack. Max 6 stacks (+90% damage to powerful enemies). Final stack does not refresh. Rapid Power weapon kills grant Power Broker to all allies. Power Broker: Increases all damage output by 15%. Lasts 5 seconds. Fireteam stack. Max 6 stacks (+90% damage). Final stack does not refresh. Breaking an energy shield with a matching element marks the target, increasing all ally damage dealt to that target by 50%. Your consecutive non-lethal power weapon shots mark the target, increasing all ally damage dealt to that target by 5%. Lasts 5 seconds. Personal stack. Max 5 stacks (+30% damage). Can refresh. Sprinting for 5 seconds increases movement speed for the whole fireteam. Rapid kills while hip firing increases weapon stability for all allies. Lasts 5 seconds. Does not stack. Does not refresh. Getting reduced to critical health grants +3 resilience to all allies. Gaining health through the effects of a perk grants +3 recovery to all allies. Rapid precision kills increase movement speed while aiming down sights for all allies. Reviving a fallen ally grants an overshield to all other allies. Lasts 5 seconds. +50HP. Does not stack. Can refresh. Every 100 enemy kills grants bonus Clan XP and a Gunsmith Telemetry. Completing a Patrol grants extra Tokens and Glimmer. Completing a Public Event grants extra Tokens and a chance to receive an Exotic engram. Completing a Meditation grants extra Tokens and Legendary Shards. Completing an Adventure grants Legendary shaders. Completing a Heroic Adventure grants extra XP, Clan XP and Legendary shaders. Completing a Strike grants extra XP. Completing a Heroic Strike grants more extra XP. Completing a Nightfall grants an increased chance to receive Strike-specific loot. Completing a Prestige Nightfall grants an even higher chance to receive Strike-specific loot. Completing a Raid or Raid Lair grants an increased chance to receive Masterwork loot. Thanks for reading. I hope this idea is something you found interesting or stimulating. A couple more concepts are on the way, so please look forward to it. Special thanks to Dan and Torres for reviewing my concept and helping to shape some of the ideas. See you next time. This is an amazing idea. BUNGIE hire this man!